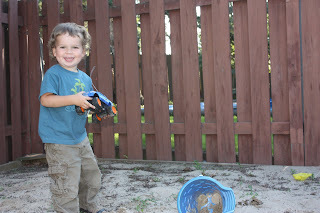 A few pictures of the boys playing in the sandbox. Since we don't have a finished backyard yet we spend a lot of time at my parents house. They have a huge backyard with a sandbox and lots of fun toys for the boys. We did however get our final grade approval today, so we will be starting to finish our yard. Finally! P.S. Happy Birthday Amber!! We love you!! Aww thanks guys:) Love you too!